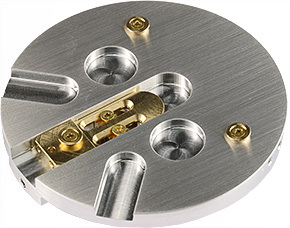 EM-Tec semiconductor wafer holders for SEM fits 100, 150 and 200mm and 4inch, 6 inch and 8 inch wafers. 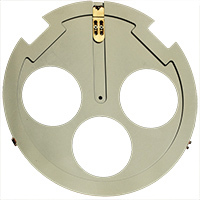 The EM-Tec wafer holders are specially designed to hold semi-conductor wafer in sizes of 51mm, 76mm, 100mm, 150mm and 200mm diameter (2 inch, 3inch, 4 inch, 6 inch and 8 inch). They are compatible with wafers with either a flat or with a notch. 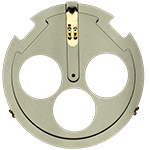 The unique locking slide is adjustable to cope with non-standard wafers. Made from vacuum compatible aluminium and self-lubricating brass. standard pin to fit on SEMs which use the standard pin; FEI, Philips, Zeiss, LEO, Leica, Tescan, Aspex, RJLee, AmRay, Cambridge Instruments, CamScan, ETEC and Novascan SEMs. Ordering Information for EM-Tec wafer holders for SEMs using pin stubs; FEI, Philips, Zeiss, LEO, Tescan, Aspex, RJLee, AmRay, Cambridge Instruments, Leica, CamScan, Aspex, ETEC and Novascan SEMs.